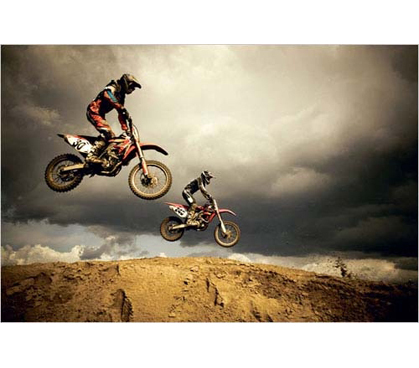 Whether you actually own a dirtbike or not, this Motorcross Dirtbike Flying Across Jump - Wall Poster makes a great dorm decoration. 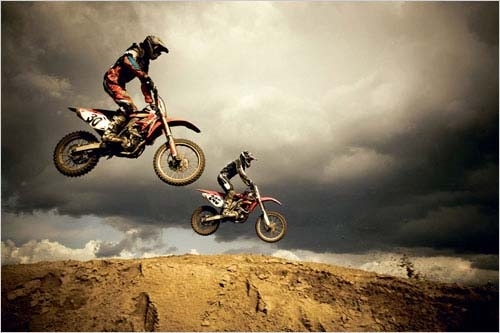 With these adrenaline charged riders, you'll enjoy every second you stare at them. All dirtbike racers know that motorcross is not a hobby, it's a way of life. You'll enjoy rolling out of bed every morning when you see these talented riders getting some air on their powerful dirtbikes. If you love the outdoors, this dirtbike poster will hold your motorcross appetite over during the winter. With this cool dorm room decor, impress your new friends and keep a piece of home with you. Don't be suprised if you dream about riding every night, because this motorcross poster is sure to be your favorite.